The last few weeks we have been working hard on our project report and we have put a lot of effort into all the arrangements concerning the lab facilities at the KU Leuven. Luckily, our work has paid off and we are very excited to announce that we were able to start our lab experiments at the KU Leuven Chem&Tech department this week. Meanwhile Gloria returned to us from South-America and our new team members Cedric and Arjan were successfully integrated in the group! To our relieve they turned out to be friendly and water-loving students. So we carried on working as a happy quartet! 🙂 After some delay because of technical problems in Zambia, the Spring team also managed to collect and analyse all the necessary samples. So with this information we could officially launch our lab experiments and start up our prototypes with the same concentrations of pollutants as the ones that were found in Zambia. Before we depart we will try to conduct two similar experiments in parallel in the ‘water-lab’. On one hand we want to test the efficiency (which is just a fancy way of saying that we want to know how good it works) of the biological denitrification method we have chosen. On the other hand we want to acquire the necessary knowledge and skills to start up a similar scaled up version of this lab prototype in Zambia. 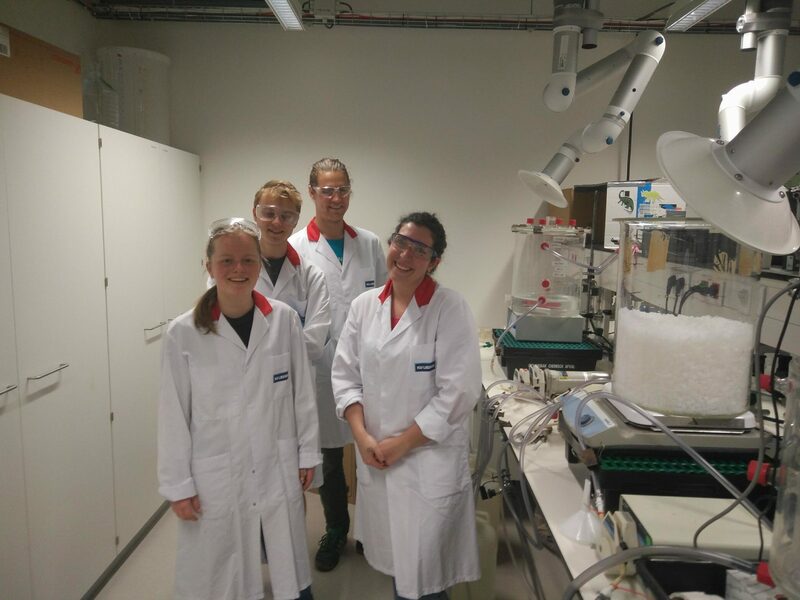 Below you can find a picture of our lab setup during one of our first days in the lab, (be sure to remember these happy faces at the start ☺ ). 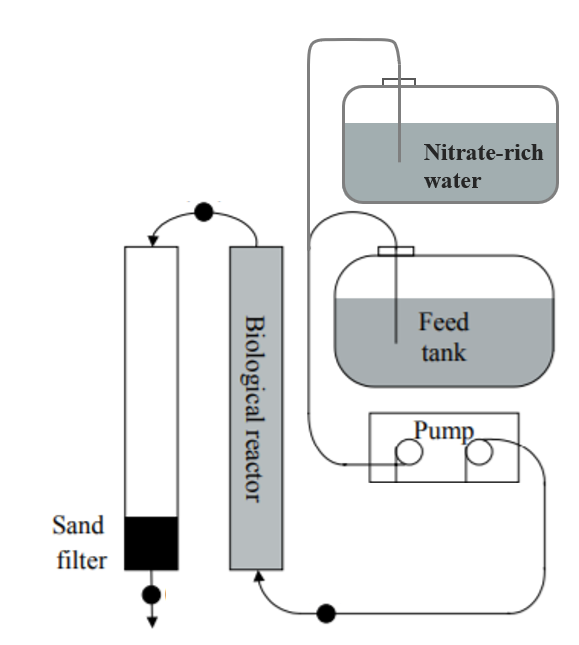 The first experiment tests the efficiency of a biological denitrification treatment for nitrate-rich water and the filtering capacity of a slow sand filter. A schematic drawing of our test setup is shown below . We will pump the ‘polluted nitrate-rich water’ (drinkable tap water that we polluted ourselves by adding the right concentration of nitrate to mimic the situation in Zambia) to the reactor together with food for bacteria. As we mentioned before we don’t want our little friends to die because they have to help us to remove the nitrates from the water, so we will feed them with a carbon source (for example ethanol, in a way these bacteria are not so different from a lot of people, they also like sugar and alcohol 🙂 ). In the reactor we have put a nice layer of little plastic cylinders with a maximum of surface area. The bacteria can attach themselves to this material, live in it, grow in it and it will become their cosy home for the next couple of months (yet again a lot of similarities with us can be found!). 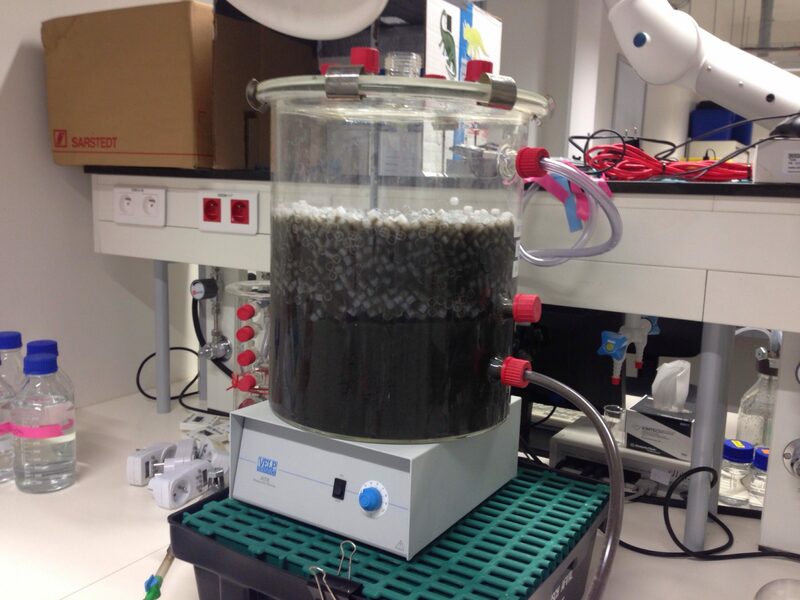 After the denitrification in the reactor, water will flow through a slow sand filter (a plastic tube packed with some sand and gravel) to remove the remaining bacteria, put some oxygen back into the water, remove little particles and to make it look appealing and drinkable as well. Ho! Stop! Don’t start drinking it just yet! We still need to test the ‘purified’ water to see if we (or actually the bacteria) did our jobs well. The second set-up is testing the growth velocity and acclimation of denitrifying bacteria in the water column by using pond sediment. This test has been assembled in the same way except for the slow sand filter. We hope that everything goes well and our little friends behave as they should (we would really hate to see this relationship end on bad terms). We will therefore withdraw ourselves into our constricted lab area. You will hear from us again, next time probably speaking to you from the beautiful African continent! DELLA ROCCA, Claudio; BELGIORNO, Vincenzo; MERIÇ, Sureyya. 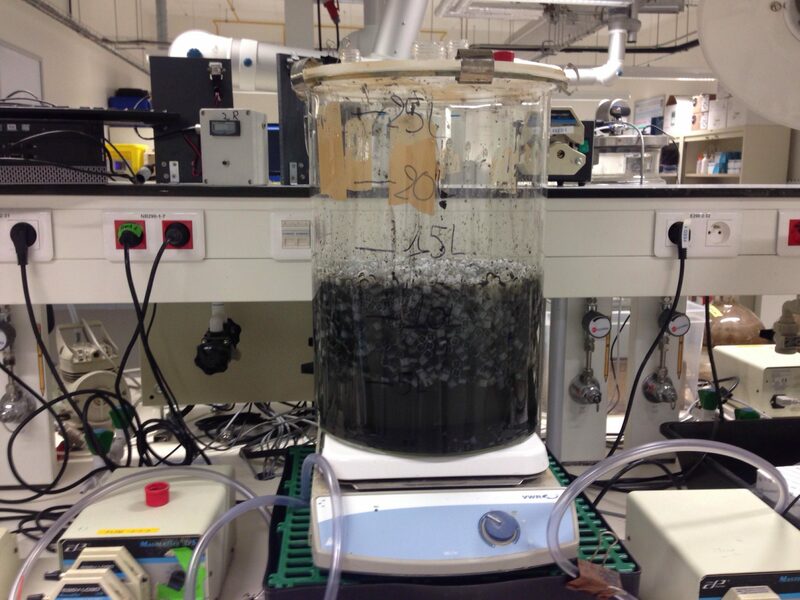 Cotton-supported heterotrophic denitrification of nitrate-rich drinking water with a sand filtration post-treatment. Water Sa, 2005, 31.2: 229-236.